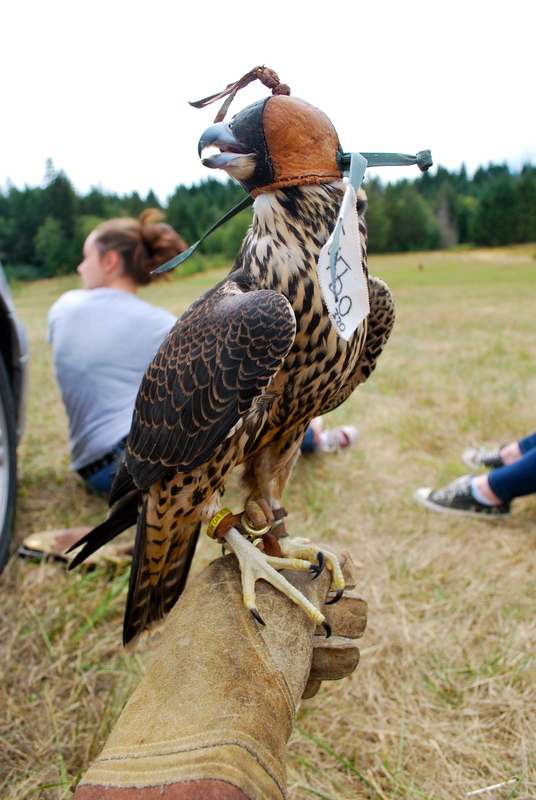 I have been busy for the past week attending a falconry apprentice course at The Raptors center in Duncan BC. 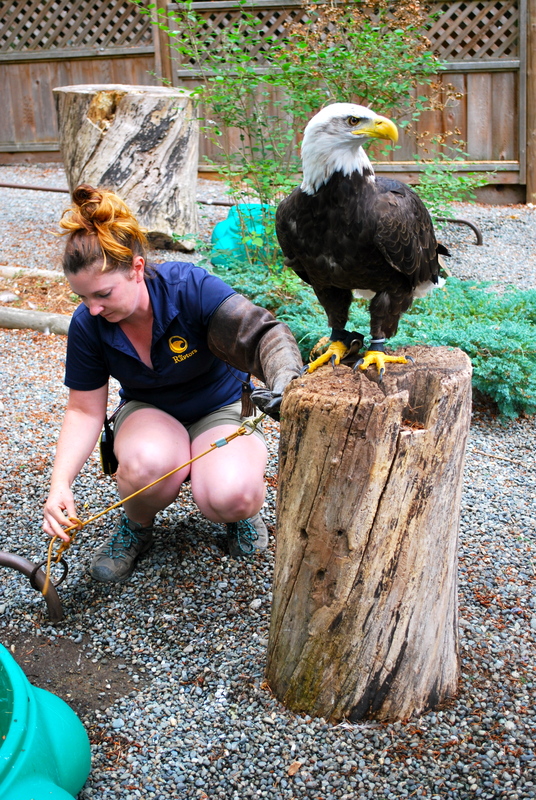 An amazing facility with great staff caring for over a hundred different birds of prey. A good number of birds are on display for visitors and many of them are working animals, employed at chasing gulls away from airport runways and dumps and performing for film and television. Among the more impressive species they have are bald eagles, golden eagles, a Maribou stork and beautiful white gyrfalcons. There are also many species of owls, lots of different species of hawks and falcons, a few turkey vultures and a tiny kestrel no bigger than a robin. 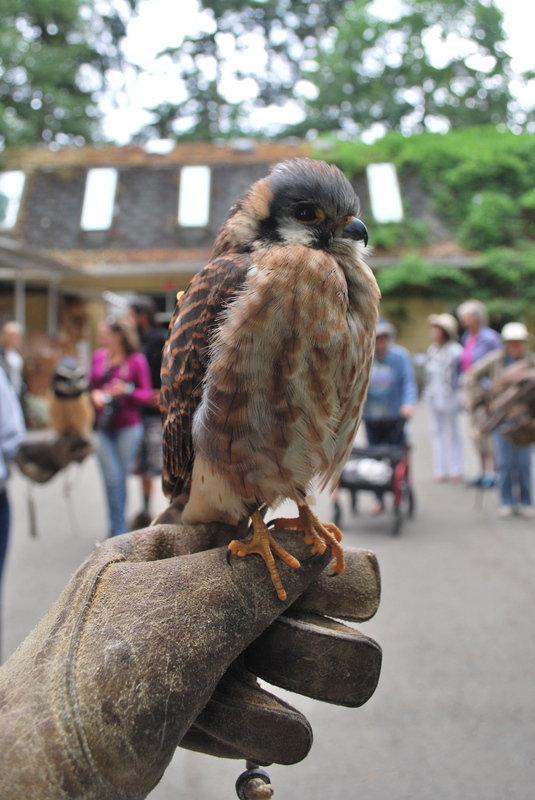 I learned many things there, including how to man (carry on the glove) many different kinds of birds, how to replace (imp) a lost tail feather, clean aviaries, how to tie a falconer’s knot, and how to train birds with a flying lure. I learned that you need at least two years of experience before you can man eagles because they are very dominant and will do whatever they can to intimidate you. They also hold a grudge against you if you do something like trim (cope) their beaks and you will not be able to work with them for a few days if you do. 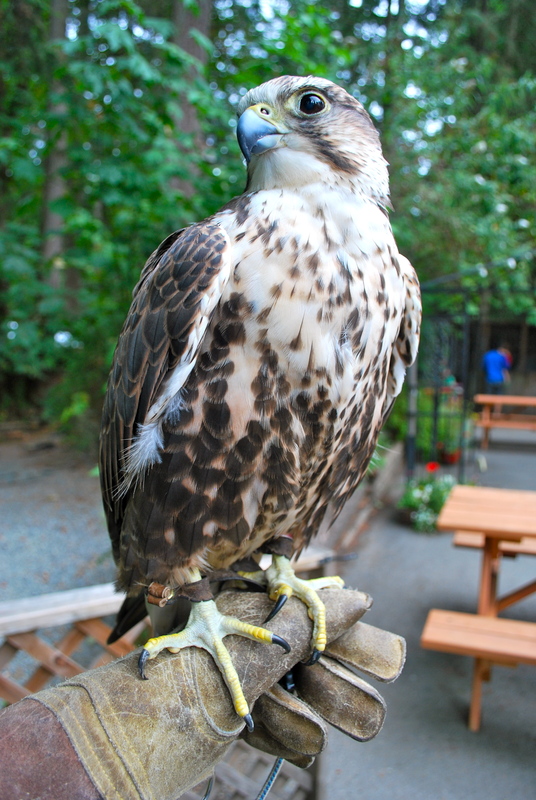 I learned that Harris hawks are one of the only raptors to hunt in packs, and that turkey vultures can be among the most dangerous birds to handle. I learned how to make jesses, which are leather straps that tie into anklets on the birds legs and allow you to secure the bird in your glove, and also that weight is very important and the birds are weighed every day in order to find out if they are ‘keen’ enough to be flown. 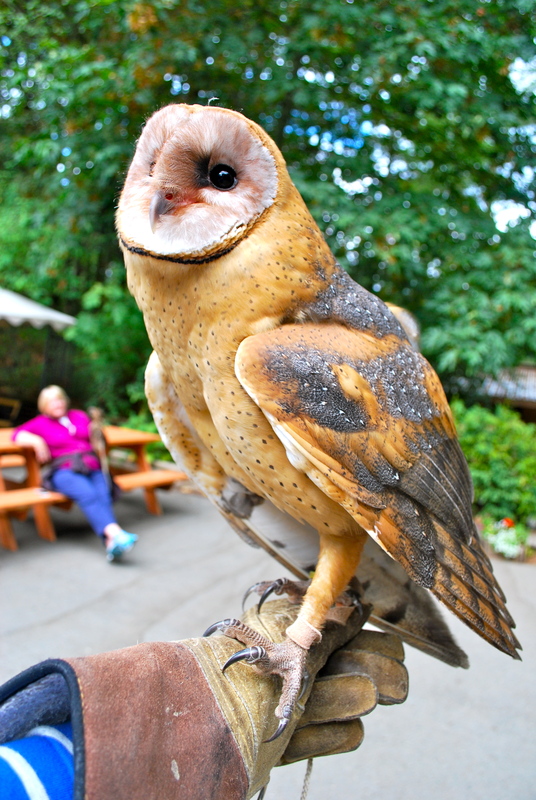 I learned about how things can sometimes go wrong, as while I was there a couple of young barn owls were taken out for flight training and were lost in the nearby trees for multiple days before they could be recovered. I also learned that feeding birds day old chicks on the glove can be messy business when they rip into the yolk sac and then spray the contents all over you! All the mess and danger was worth it though, and it was one of the best experiences of my life. I was bitten once or twice by hawks, and it wasn’t half as bad as I was expecting. I handled a turkey vulture briefly and escaped unharmed. 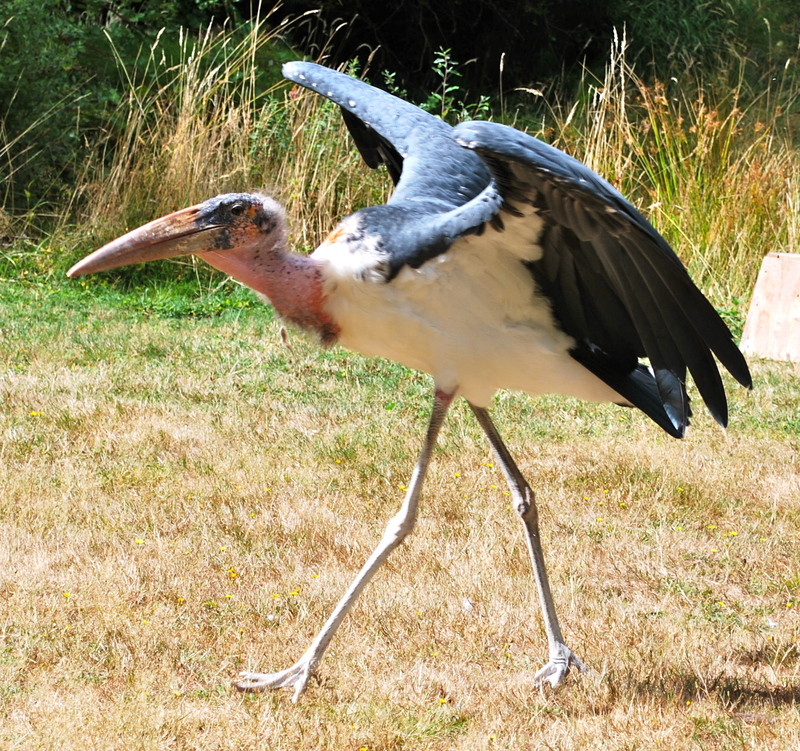 Luckily I was not footed (grabbed by the talons) by anyone which is what can cause real damage. Most of the birds are very well-trained and the staff are excellent educators. I really can’t recommend the experience enough. I had such a rewarding time there that I’m planning to begin volunteering on a regular basis. Since I already have the apprenticeship course under my belt, I can be much more useful, although I do expect to spend a lot of time hosing down aviaries, cutting raw quail and rabbits into tiny bits and making jesses. For me it’s worth it to get to be around such magnificent predators. 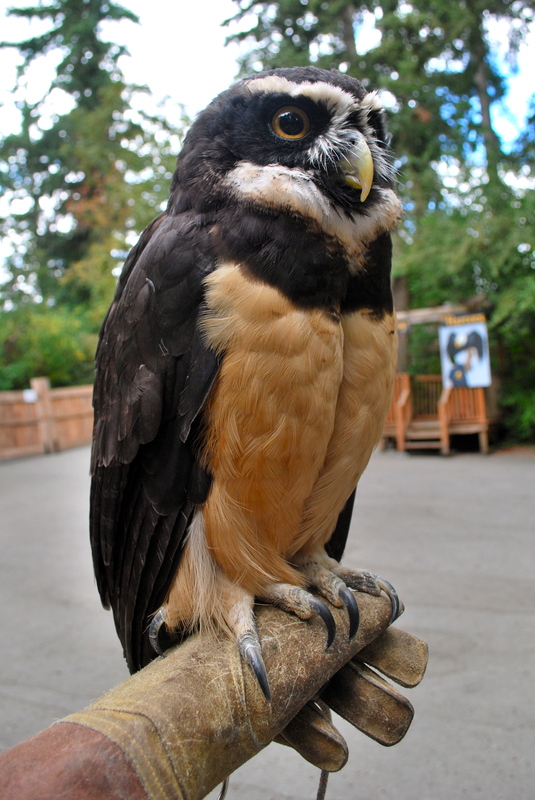 My ultimate goal is to obtain my own bird and take up falconry. In British Columbia the only thing legal requirement is a suitable aviary or mews which has been inspected by the relevant authorities. My choice would be a Harris hawk which is also a very good beginner bird. Hopefully I can move towards this goal as I gain more experience at the center and see if it’s a good fit for my lifestyle. I basically already run a raptor feed supply company with all the quail, rabbits and pigeons I breed! 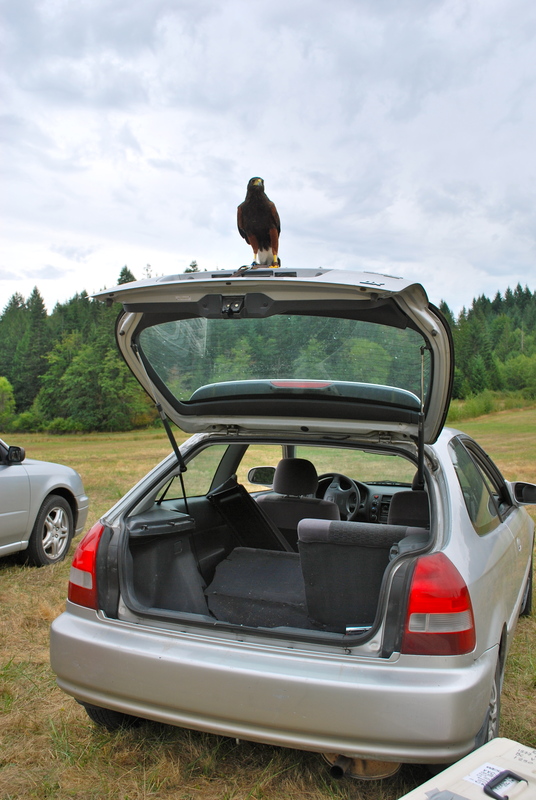 This entry was posted in falconry and tagged american kestrel, bald eagle, barn owl, birds of prey, british columbia, falconry, harris hawk, maribou stork, peregrine falcon, spectacled owl. Bookmark the permalink. Wow, what impressive creatures and what an interesting experience! Great pictures and a neat story!